Super Bowl Time-Food, Food & more Food! 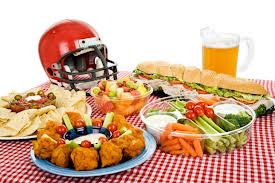 How many of you are hosting or attending a Super Bowl party? I'm sure many of you are! Now some of you may just be staying home with your kids and spouse, like me, and that's fine! The problem is trying to come up with Super Bowl food or snacks for only a few people. There is so much out there, but obviously I have to narrow it down. Hubby is thinking of ordering some food from Chili's. They do have some good options, but I thought it would be better to make something myself. Although if we order then there is no clean up. Ordering from Chili's is looking like the better option now. LOL! I hate cleaning up, especially on a Sunday night when I have to work the next day! After our food choices have been finalized, I'm looking to just sit back, enjoy the game(Go Ravens), and stuff my face!! My FitnessPal is going to hate me on Sunday! Maybe its not even worth logging in on Sunday! Have you planned your Super Bowl Sunday? Wordless Wednesday ~ The Letter "I"